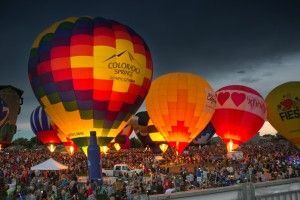 Experience roughly 70 hot air balloons floating effortlessly over the breathtaking Colorado Springs landscape at the 2018 Labor Day Lift Off. Arrive at Memorial Park by 6:30am to watch all the gentle giants come to life during the morning lift off. There will be a mass balloon lift off each morning from 7am to 9am. 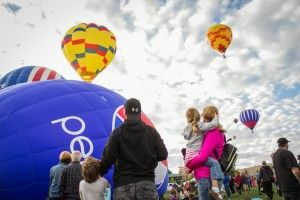 Families and children can be surrounded by the action and walk among the balloons as they inflate and launch. If you’re interested in participating in the lift off, click here for more information and to book your flight. As the sun sets at Memorial Park, watch as hot air balloons “glow” amid the night sky. Balloon glows are perhaps the most spectacular part of any balloon festival. The many balloons will inflate and ignite their burners, resulting in a magical dance. These spellbinding balloon glows are scheduled for 7:30pm on Saturday and Sunday. We recommend arriving early to check out local vendors and ensure prime parking.